Who would have thought? Lucy Cousins' favourite animal is...a leopard! NOT a mouse! And Eric Carle? He loves CATS! 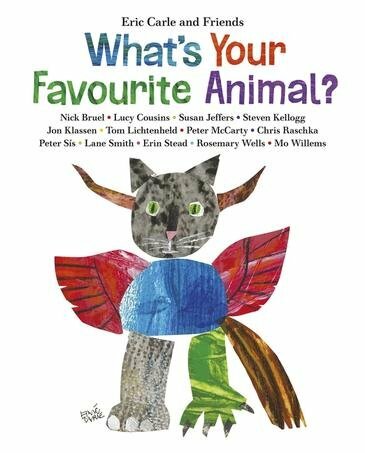 Find out what other award-winning author/illustrators' favourite animals are in this stunning new collection from Eric Carle and friends. Bringing together some of the finest modern children's book illustrators of our time - Jon Klassen, Eric Carle, Lucy Cousins, Nick Bruel, Susan Jeffers, Steven Kellogg, Tom Litchtenheld, Peter McCarty, Chris Raschka, Peter Sis, Lane Smith, Erin Stead, Rosemary Wells, Mo Willems - Eric Carle asks, "what's your favourite animal?" and the result is an astonishingly colourful parade of animals from giraffes with their heads in the clouds to fuzzy dogs to squishy snails. Some artists reveal their choices with a personal story, others with a comic turn, but all will undoubtedly inspire children to draw and tell a story about their own favourite animal! This is the perfect book for any picture book lover with an unbelievable collection of illustrations from luminaries such as Jon Klassen, Lucy Cousins, Mo Willems and Eric Carle!